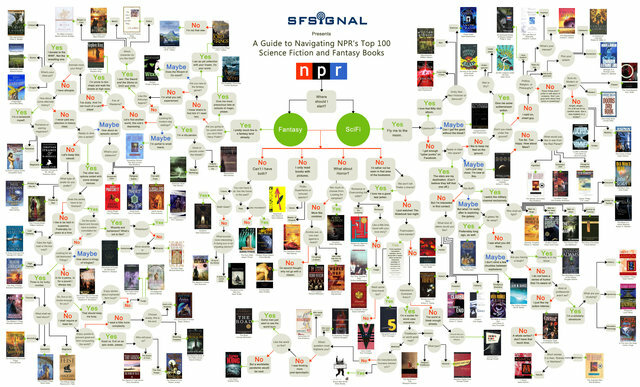 A few months back, NPR compiled a list of the 100 best science fiction and fantasy books. There were, of course, no arguments. Everyone agreed precisely on what was included and what was excluded, and what placement each book/series received. I mean, who doesn't think the Wheel of Time series is the 12th best thing ever to come out of the world of SF/F? Or, for that matter, that the number of women in the top 50 should be able to be counted on one hand? If you meant to dive into this list, but were waiting for someone to produce a flowchart that might help you navigate your way to a starting point by way of pithy questions, well, you can relax. Sf Signal has made such a flowchart, and everything makes sense now. Follow the link for the embiggened one.